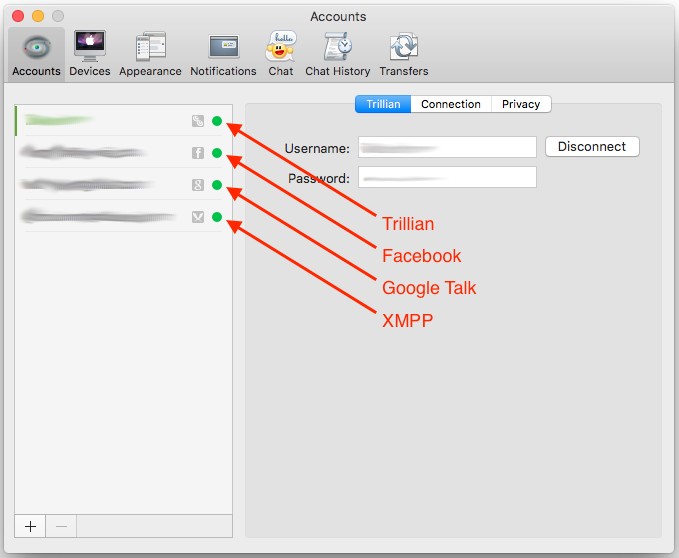 Trillian is the only app that I know about that lets you have Facebook Chat, Google Talk and your regular Jabber/XMPP accounts all in one place. Now that Facebook Chat stopped working in OSX Messages, Trillian really does look like the only alternative. I downloaded Trillian and gave it a shot. Overall impression is fairly average, but it does the job. The first thing I noticed is that you must have a Trillian account. I don't know anyone who actually uses one, but that's the requirement. Once you set that up, you can log in and add your other accounts. I had some trouble with Google Talk but found a way to get it working with Trillian. The app keeps all your IM accounts in one window by default. The experience is very similar to Adium but less customisable. If you're using Facebook Chat, you will notice the immediate lack of sticker support. That's not a big deal but would have been nice to have. The other chat accounts worked exactly as they should have for more. Since this is the only choice out there, it is currently the best choice for having an app that puts all your social media/IM accounts into one place. I just hope the Trillian team adds the few extras like stickers and more customisation options to make this a truely great chat app.